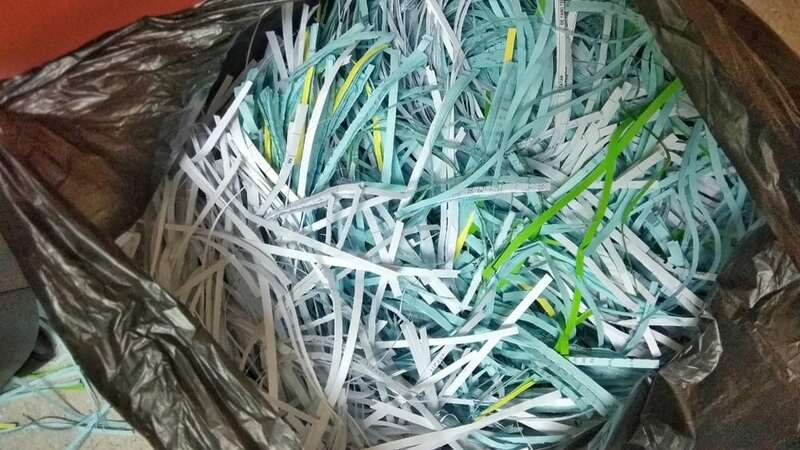 Shredding old documents is the best way to destroy private information and avoid any data breaches. That seems simple enough, but do you know what can and can’t be shredded? Should you put everything through the office document shredder, or use a shredding service? While it might seem easier to just shred everything in the office shredder, a lot of time is wasted removing staples and paper clips, and shredding documents one at a time so they don’t jam. Your confidential documents are all locked away in a container supplied by the service. It’s regularly collected, the contents are shredded in commercial shredders, and you’re issued with a certificate of destruction. Your privacy is assured, and your sensitive data is completely secure. Even shredded paper can be partially reconstructed to read important data. When you use a document destruction service that recycles, your shredded paper is used to make other paper products. There’s also the issue of recycling for the environment. Every time paper is recycled, it saves thousands of trees being cut down to make new paper. Do go through your unwanted documents to be sure there are no thick cardboard folders or plastic in there. Small bits of plastic are fine, as are small metal bindings, but the goal is to shred mostly paper so it can be recycled as paper. Too much plastic and cardboard won’t be accepted by the recyclers. Don’t keep your unwanted devices. They contain private data, even if they’ve been erased. Don’t throw them out for the same reason. Your document shredding company should also offer a secure product destruction service and recycle the remains. You can shred old devices, hard drives, thumb drives, ID cards, credit cards, marketing materials, and anything else that contains private information. Using a shredding service is the best way to go, but once those documents and products leave for the shredder, there’s no getting them back. Always double check that you don’t want anything that’s about to be shredded. Don’t throw a stack of papers into the secure shredding container without making sure there’s nothing you need. There are many shredding services available, but they’re not all created equal. Do your due diligence when it comes to choosing the right service. Ask about the chain of custody for documents and products destined for shredding. Where are they going? Who will see them? What happens once they’re shredded? Do they recycle or dump in landfill? Don’t assume your documents and products have been shredded just because they’ve been collected. A lot can happen between your office and the commercial shredder. Choose a shredding service that gives you a certificate of destruction when the job is complete. That way you can be sure your data is safely destroyed. Need Help with Your Shredding? Your employees have better things to do than sort through items headed for the shredder. In Confidence will take care of all the sorting for you. As long as you’ve thoroughly gone through your pile, we’ll do the rest. Once it’s been shredded, we’ll issue your certificate of destruction for your peace of mind. Call 1300 723 187 in Melbourne, or contact us online.